Jim Merrill has been proud to hold to the tenets of Green Design since he began in the construction industry in the mid-1970's. Today, with Merrill Design, he applies over two decades of Green Design and practical construction experience to every project. At Merrill Design, we believe that our commitment to making a more environmentally sustainable home requires a perspective of practicality overhype. We know that the best Green homes begin with the right design, the most energy efficient specifications, and the application of proven, durable materials. Energy Efficiency is at the core of our Practical Green Design sensibility. One of the greatest ways a homeowner can decrease his or her impact on our environment is to reduce the amount of energy used to sustain a comfortable home environment. Less energy used by a home means a reduced carbon footprint and less need for the impact caused by resource extraction or hydroelectric generation. A home or other structure which requires less energy to maintain over its lifetime will also save its owner a great deal of money in a world where energy costs continue to increase. Choosing materials which are made to last, even in the challenging Northwest environment is another key pillar to Practical Green Design. Increasingly our society is moving toward materials and construction techniques which are not built for the long-term. With a throw-away mindset, we are forced to replace and re-build our structures more frequently, and the cost in materials extraction, and energy use is enormous. At Merrill Design we are thinking ahead to a future where the structures we design will remain standing, and materials produced once will not need to be replaced. In this way, we can ease our society's impact on the ecosystem. Even if we choose durable, energy efficient materials which are more costly to produce initially, they will more than make up for their own impact by the fact that they will not need to be replaced in future years. And all of this equates directly to a savings for the homeowner as well. Through design techniques such as proper overhangs, solar orientation, daylighting, and specifying good insulation with natural air-flow, we can design architecture which works with nature to create a comfortable, beautiful, and economic building. For example, we have applied proven technology such as Structural Insulated Panels, (SIPs), to create extremely efficient, affordable structures, some of which have been performing flawlessly since the 1980's, and will continue to hold up far into the future. Merrill Design thinks green from the very inception of your project, and we encourage you to do so as well. When you sit down with Jim Merrill to plan the home of your dreams, he will consider the fundamental factors which could increase your home's efficiency as well as take care of the important details like use of natural light, more efficient plumbing layouts, and even suggestions such as thermal mass, (for temperature control), and use of proven green roof and rainwater reclamation technology. 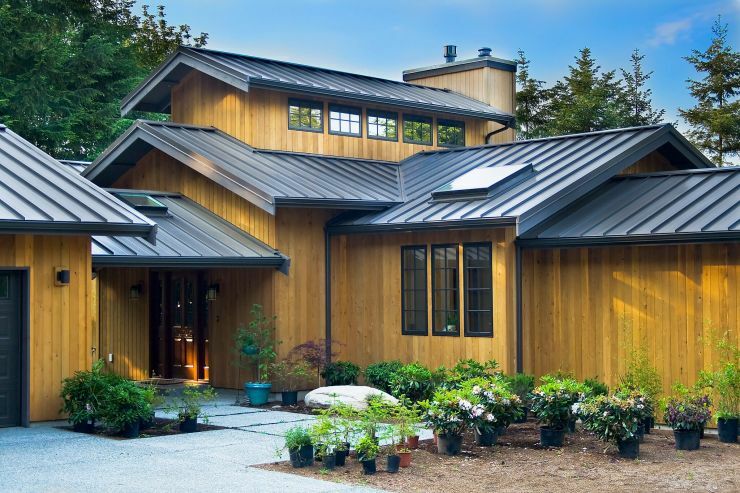 In short, Merrill Design applies the right technology and material for the job, to design a home which is long lasting, easy on your energy budget, and most of all a comfortable and practical place to live. That is Real World Design.